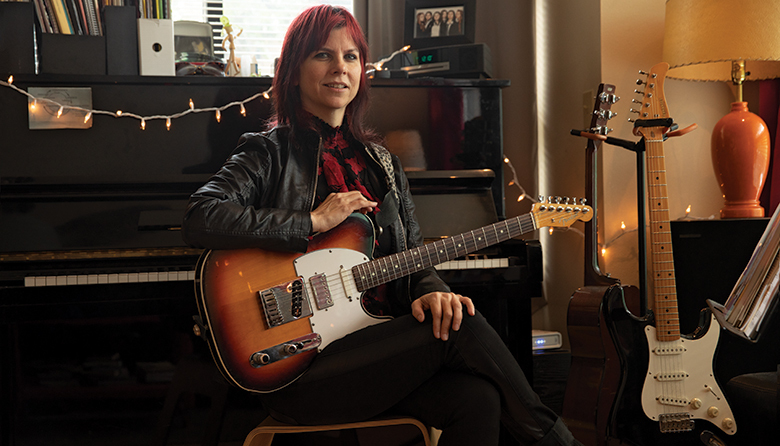 Kathy Moore is an accomplished guitarist who performs live in several Seattle bands. She also is a composer, an arranger and a popular music teacher — offering lessons on both the guitar and the piano. Twelve. My favorite is a 2006 Fender Telecaster that I bought from my favorite guitar player, Bill Frisell. Name a memorable moment playing on stage. It was after David Bowie died. I was playing “Lazarus” from Bowie’s last record, and my bandmates [Barrett Martin, Justin David, Jeff Rouse and Max Rose] let me play it the way I was feeling it. Being allowed to honor David Bowie so fully was a beautiful gift. Name a memorable moment as an audience member. If you could meet any guitarist, live or dead, who would it be? I’ve met Jeff Beck, and that’s who it would be. I also wish I’d met Wes Montgomery, an incredible jazz guitar player who kind of wrote the vocabulary of modern jazz guitar. How would you describe the Kathy Moore sound? I think of my guitar as an opera singer, so there are lots of soaring notes that are like singing to me. The nature of that feels spiritual. Music. Yoga. And I do this thing called walking meditation, where I think about the day and reflect on what I did and how I might improve my behaviors going forward. Never. When I play with great guitar players, I feel exhilarated because it makes me play better … and if I get really excited by someone, I might even get better that night! There aren’t that many women who can shred on the electric guitar. Do you consider yourself a badass? Practice. I probably had some natural ability to play music, but I practice all the time. Have any of your students “made it”? Well … I teach [Pearl Jam’s] Mike McCready. Not how to solo (big laugh) but how to read music and play scales. Do you have a favorite female guitar player? Emily Remler was a jazz guitarist and she was the best. Have you experienced sexism being a female electric guitar player in a predominantly male business? Yes, and it’s usually when someone comes in from out of town and they’re looking for players, and it’s assumed that the most capable person would be a man. I think they hear me through that filter. Have you had the experience of proving those out-of-towners wrong? Uh-huh. And it’s the greatest thing in the world! I love funny people. If I can sit next to a funny person and let them entertain me before I go on stage, that helps me a lot. I grew up poor, so I’m still having to learn the rules about money. They should teach that better in school. I care more about relationships and about doing what I love, so probably not much different from what it looks like right now. Fran Lebowitz, Conan O’Brien, Dorothy Parker and Bill Murray. I started an event called “Synthesis New and Experimental Music” where I invite musicians from all genres to perform original work solo or in a duet. Each show has four performances and they tend to be wildly different and very exciting. You’re stuck on a desert island and can have one book, one record, one food and one guitar. Mark Twain, “Letters from the Earth”; John Coltrane, “Love Supreme”; lemon-coconut cupcakes because you can take the bottom off and put it on the top and make a cupcake sandwich; my 2006 Telecaster.